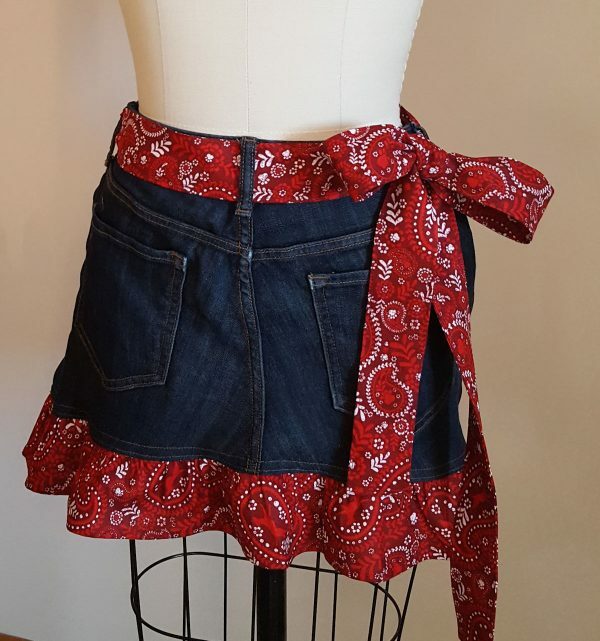 Don’t ditch those old jeans, transform them! If your spring cleaning has turned up pants that no longer fit or are out of style, recycle them into a fun, upcycled apron. 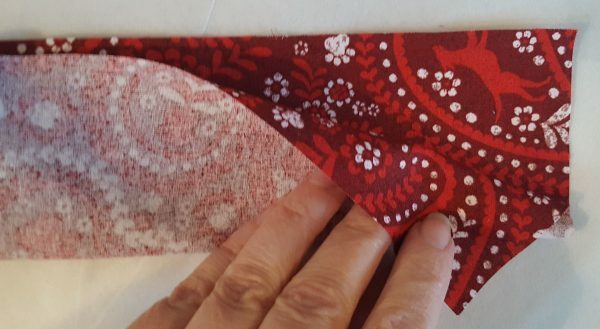 Just add a bit of fabric and in a few hours you’ll have the perfect housewarming gift, Mother’s Day present, or just a fabulous new kitchen accessory. 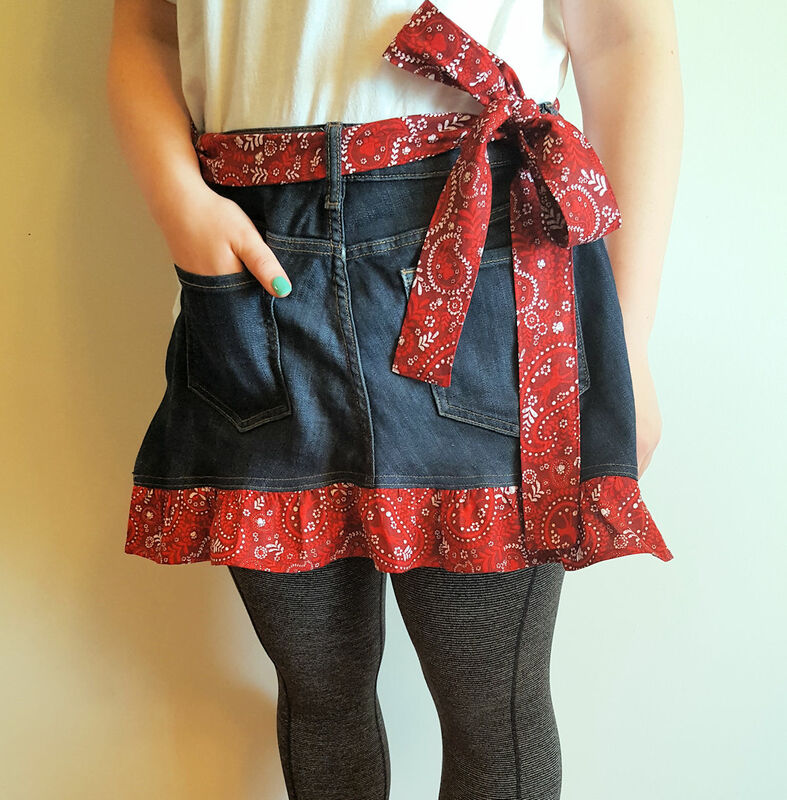 Want to make this apron even more personalized? Embellish the pockets with a bit of machine embroidery or with the decorative stitches on your machine for a lively new look. 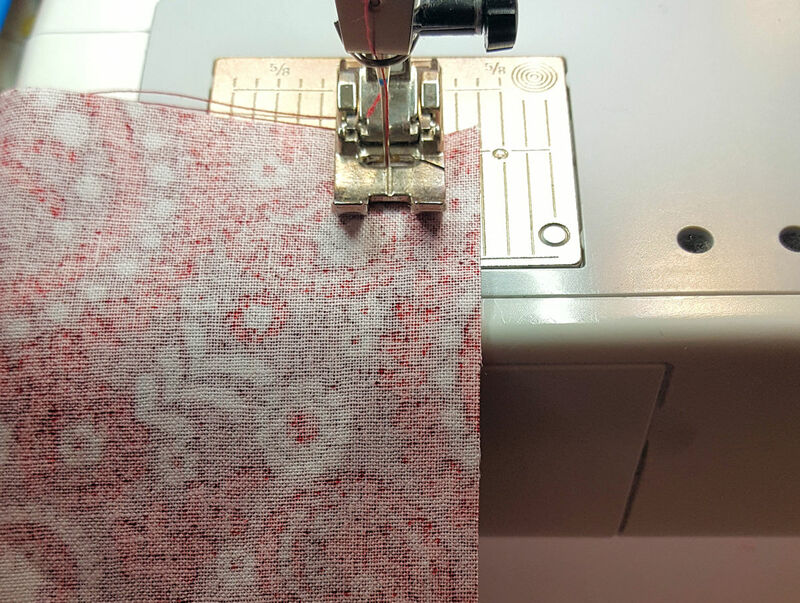 All seams are 1/2″ unless otherwise noted. To make the tie, cut 2, 5″ x 43″ rectangles. (This measurement will make an 84″ finished tie. Add additional length to make a longer tie or more dramatic bow or shorten the tie as necessary). Sew the two short ends of the tie, right sides together. Fold the tie in half lengthwise, right sides together. Sew around all the open edges, leaving a 4″ opening for turning. Clip the corners and turn the tie right side out through the opening (if necessary poke the corners out with a chopstick). Press and topstitch along all the sides of the tie (this will also close the opening). Set aside. 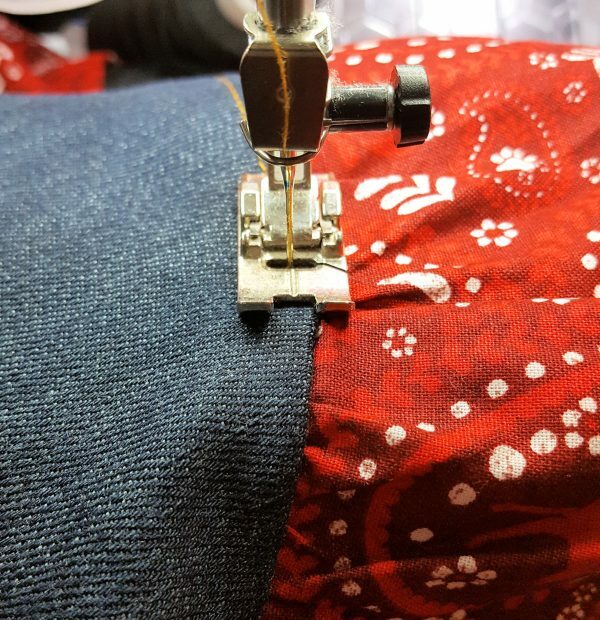 Cut jeans along each side seam. 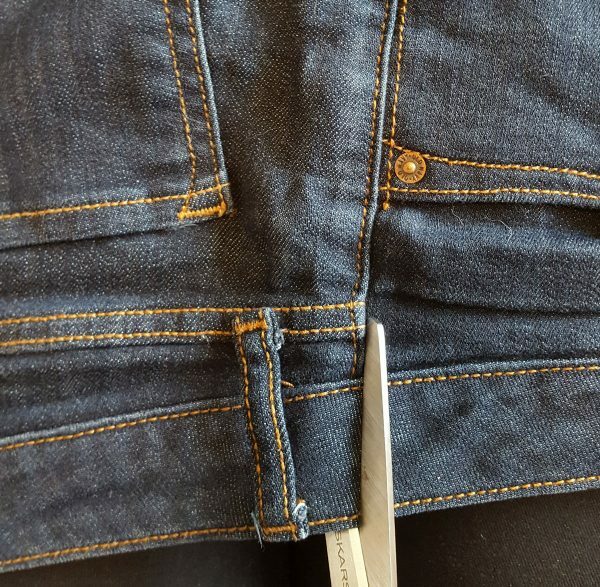 On the back of the jeans, measure 12″ down from the top edge (this measurement can be lengthened if you want a longer apron) and cut crosswise. 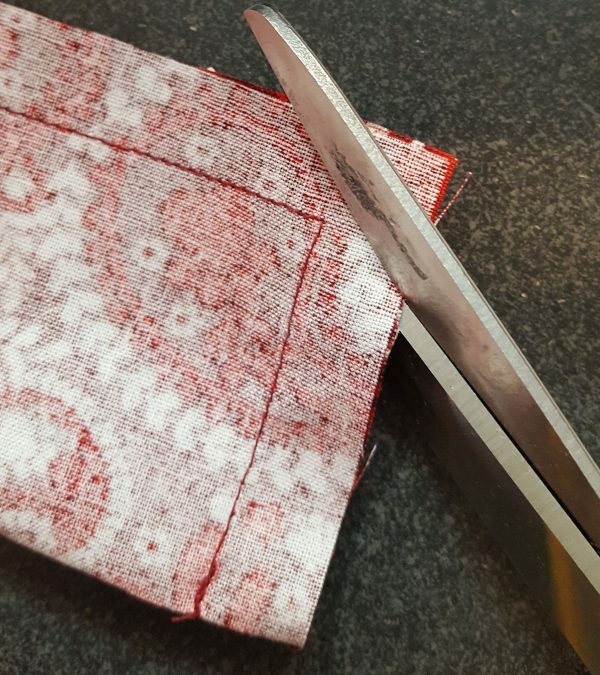 If your denim tends to fray, you can zigzag stitch across the raw edges before moving on to the next steps. Fold back the side edges of the apron 3/8″ and stitch. Measure across the width of the bottom apron edge, then multiply this number by 1.5. The final number will be the length of your ruffle. (For example, the bottom width of my apron measures 23″. When multiplied, the ruffle length will be 34.5″). 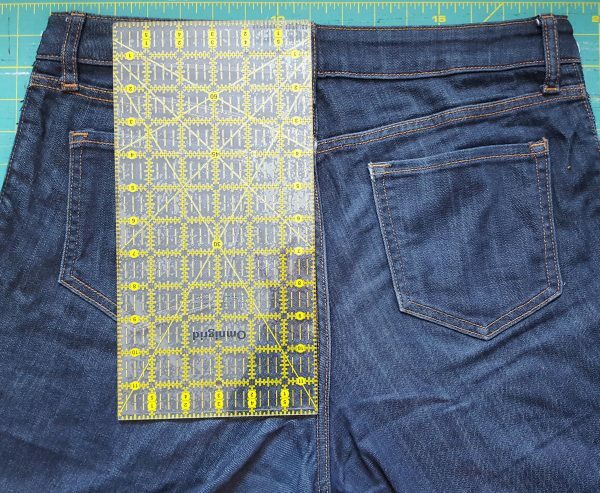 Now cut a strip of fabric using this measurement by 4″ wide (in our example the strip measured 34.5″ x 4″). Finish one long edge of the fabric ruffle by creating a narrow hem. To do this fold under 1/2″ then fold the fabric again creating a finished edge. Stitch the hem in place near the folded edge. Repeat this process to make narrow hems on each short side edge of the ruffle as well. Using the longest stitch on your machine, sew two rows of basting stitches: one row 1/4″ away from the raw edge and another 1/2″ away from the unfinished edge. In the photo, I have used contrasting thread so the rows stand out in the photo, but in your version, be sure to use matching thread. 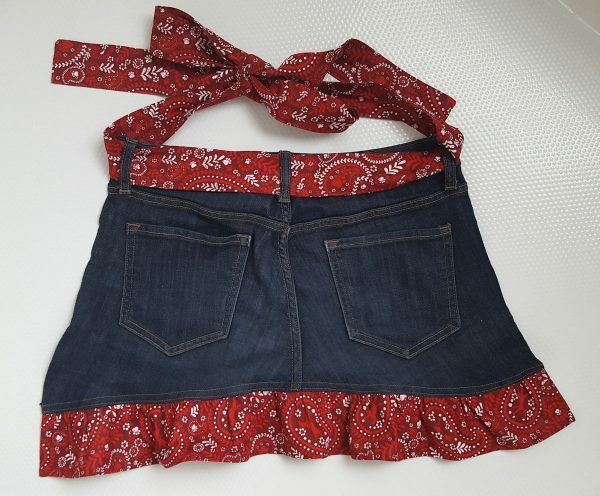 With right sides together, pin the ruffle to the bottom edge of the apron, matching side edges. Pull the bobbin threads of your basting stitches until the ruffle fits the length of the apron. 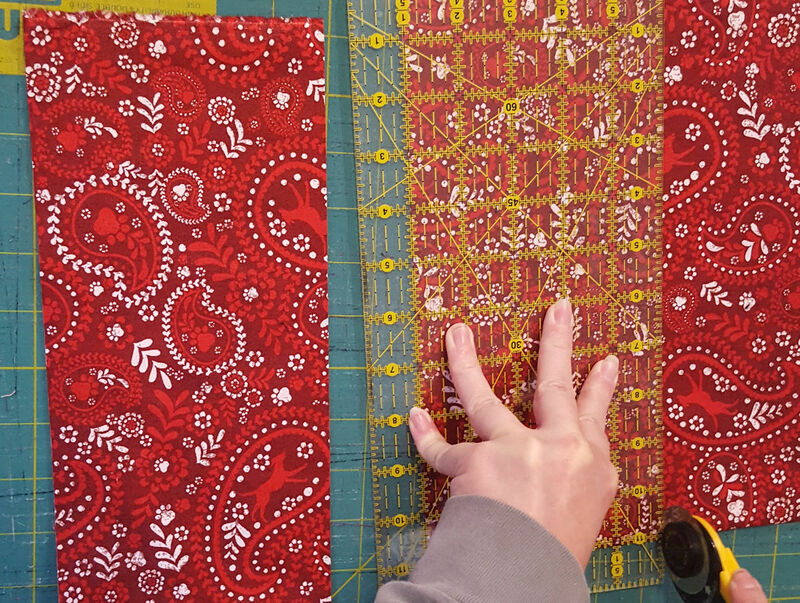 Distribute the gathers evenly and stitch in place. Remove any basting stitch that may show through on the right side of the apron. Press the seam allowance of the ruffle toward the apron, then topstitch 1/8″ away from the seam. if desired, add a second row of stitching for a more decorative look. 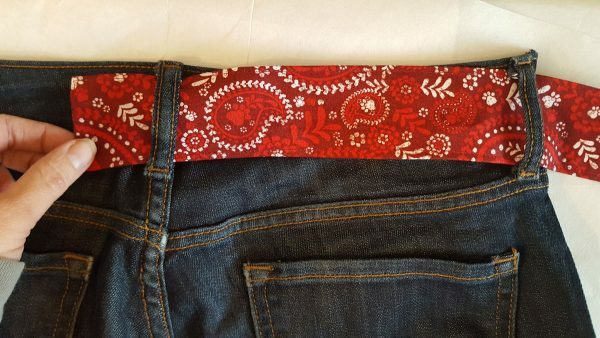 Thread the tie through the belt loops. Now show off that apron! This is a cute idea! Found an old pair of jeans that I had set aside for patching other old jeans. Am all ready to make this apron! Thanks for sharing this idea!